The following exchange is a re-creation based on an investigation launched in recent months by the Israel Security Agency (Shin Bet) and announced last week, which uncovered an al-Qaida plot to bomb multiple targets in Israel, including the American Embassy in Tel Aviv. In late 2013, two Palestinian men, one in Gaza and one in east Jerusalem, allegedly conducted Internet conversations for the purpose of planning a series of mega terror attacks. On one end of the chat, in the Gaza Strip, sat a man named Ariv Al-Sham. According to the Shin Bet investigation, Al-Sham took his orders directly from the head of al-Qaida central, Ayman Al-Zawahiri. On the other end was a 23-year-old resident of east Jerusalem, Khalil Abu-Sara, who could barely hold back his enthusiasm for massacring civilians in the name of jihad. "What targets do you know of?" Al-Sham asked his new recruit. "I know Jerusalem well. There is, for example, the Jerusalem Convention Center," Abu Sara said, referring to a landmark conference building situated opposite the Israeli capital's central bus station. "Let's talk about the Jerusalem Convention Center," Al-Sham said, pleased with the suggested target. Later, he asked Abu Sara, "Other than Jerusalem, what else do you know? "I know Tel Aviv well too. The U.S. Embassy is located there," Abu Sara said. "Let's look at that," Al-Sham said. Later, in chats over Skype and Facebook, the two men settled on a plan to bomb both sites – the Convention center and the embassy – simultaneously, and to murder emergency responders in Jerusalem with a follow-up suicide truck bomb. As the plot unfolded, Al-Sham goaded Abu Sara into giving him information on targets, and the conversation would then turn into operational attack plans. In December, Abu Sara was arrested with two other men, one from east Jerusalem and another from the Jenin area of the northern West Bank. During questioning, Abu Sara told the Shin Bet that his handler in Gaza made it clear to him that he was in direct communication with Al-Zawahiri. "We have no reason to doubt this," a senior Israeli security source, familiar with the plot, said. "Abu Sara knew the targets very well. He's a very extreme character. He had dozens of ideas for terror plots," the source stated. With Al-Sham's guidance, these ideas quickly became very dangerous plans for mass-casualty terrorism. The Jerusalem District Attorney's Office formally indicted Abu Sara and a second man Tuesday. How did Abu Sara find Al-Sham? According to the Shin Bet's investigation, he first trawled the Internet, asking Salafi jihadi elements online about where he could get hold of explosives. Abu Sara used the net to speak to bomb experts from Gaza, learning about the process of assembling explosives. At some point, in the maze of the online jihadi world, he 'met' Al-Sham. Later, Abu Sara donated funds to terrorists in Syria and made concrete plans to travel to the war-torn country himself, for jihad training. The depravity of the attacks Abu Sara was preparing to commit apparently had no limits. In one plot, gunmen were supposed to shoot at the tires of an Israeli civilian bus, execute its passengers through close-range shots, then wait for emergency responders to arrive in order to fire on them. The Shin Bet discovered in the course of its investigation that Abu Sara represented just one of three independent terrorist cells being constructed by Al-Sham in Gaza. The two additional Palestinians under arrest were each tasked with forming their own terror cells. "We did not have the privilege of waiting until they're ready to act," the security source said, adding that the plots were disrupted at an early stage of their formation. Irrespective of that fact, the Shin Bet has no doubt that the suspects were deadly serious in their intentions, and members of the domestic Israeli intelligence body caution against taking the plots lightly. In fact, the veteran agency, which has seen and thwarted countless terror plans for mass murder, views this episode as both highly unusual, and as a warning signal about the potential for setting up al-Qaida networks through the online recruitment of Palestinians and Arab Israelis. "It would be a mistake to think this an amateur plot," the senior security source said. "This is how the global jihadis operate. They connect between terrorists and weapons through the Internet and create commanders. They can quickly tell if they're talking to a fictional character or a real jihadi fighter. There are expressions used, and there is a world of content. They have their own language. Abu Sara was highly familiar with the works of Salafi jihadi sheikhs." Al-Sham and Abu-Sara discussed bringing in a "back-up" force of several foreign terrorists to Israel, using fake Russian passports. 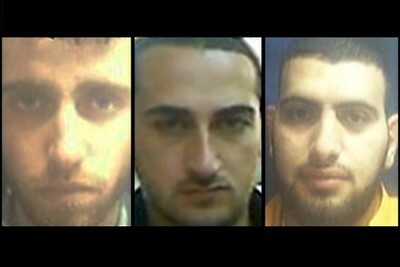 Abu Sara's intention to travel to Syria and the location of his al-Qaida handler in Gaza means that, in addition to the Internet, Salafi jihadis keen on pursuing al-Qaida's murderous agenda are quickly constructing physical bases of operation in the region, in areas that were once out of bounds to them. Jabhat Al-Nusra in Syria (al-Qaida's official regional branch), the hundreds of pro-al-Qaida jihadis in Gaza, terrorists in the Sinai Peninsula, and the growth of Sunni jihadis in Lebanon all indicate that these forces are establishing themselves in the region. In Gaza, Hamas has stopped attempting to repress Palestinians who join the ranks of groups that identify with al-Qaida. Instead, the ruling Hamas regime merely asking them not to fire rockets at Israel when Hamas deems such acts as being harmful to its own interests. Hamas can activate global jihadi cells in Sinai and get them to fire rockets at Israel whenever it wishes. "They just need to hint at it, nothing more is needed," the security source explained. This is one way for Hamas to strike at Israel while trying to cover up its involvement. Other established Gazan terror groups, like the Popular Resistance Committees, also have "excellent ties" with al-Qaida affiliated groups in Sinai. Over the course of 2012 and 2013, Zawahiri has increasingly mentioned Israel as a target in his communications to followers, as part of a drive to place the Palestinian conflict at the center of his global jihadi narrative. As the region continues to experience anarchy and violence, and the al-Qaida network exploits the regional power vacuum to grow in strength, Israel's ever-vigilant security and intelligence agencies will be on the lookout for new threats from this direction, which will surely appear.